Comfort Heaters Archives - Mor Electric Heating's Blog about home, office & factory comfort heat & freeze protection for pipes & roofs. Heavy duty industrial unit heaters featuring T3C ratings – the lowest ignition temperature rating in the industry! The DX-233 Series heaters are offered in a wide range of power outputs, voltage ratings and available control systems for custom tailoring to your needs. Dual (automatic and manual reset) over-temperature protection incorporated with a 70 PSIG relief value setting for additional user safety. A welded steel heat exchanger with painted steel heaters, steel tubes, and spiral wound aluminum fins for extra unit durability. Ideal for environments where there is a risk of vapour or dust combustion. Baked on polyester powder-coated cabinet; epoxy covered motor; NEMA 7, 9 cast aluminum control circuit enclosure. Also available in 316 stainless steel or Heresite® construction. Contact factory for information. The advanced design allows lower operating temperatures from sealed liquid-to-air heat exchanger with steel tubes, and integral aluminum fins. The pressure relief device provides excel pressure protection. 24VAC transformer; contactor; with automatic and manual reset over temperature thermal cut-outs. Adjustable covers. The WI-FI Multi-zone Programmable CONNEX Controller lets you manage your Dimplex CONNEX smart heaters using your mobile device. Both the controller and heaters feature built-in wireless technology that makes installation a breeze and allows for simple, whole-home control. And the Dimplex CONNEX App makes it easy to stay connected from anywhere. If comfort is important to you and your family, installing a Dimplex Multi-zone Programmable CONNEX Controller will have you experiencing the most important comfort of all… The comfort of control. Construction Materials: White molded polymer, with a LCD touch screen for ease of programming. The Plenum space is tough to heat. Nobody knows it better than Marley. They have an interesting new entry into the market. 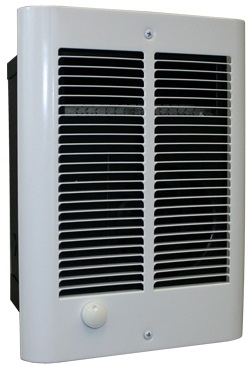 A low cost unit like heater that can be quickly purchased off the shelf and installed. CHPR25 – Approved for installation in a concealed space, an area between a finished ceiling and drop ceiling, a plenum space, or inside a plenum. • High limit thermal cutout automatically shuts off current in the event of overheating and reactivates the heater when temperature returns to normal. This heater’s sleek design with built-in electronic thermostat provides an energy efficient panel heating solution. With no moving parts, the heater provides quiet, even heat. The built-in electronic thermostat maintains room temperature to within 0.5°C (0.9°F) for maximum comfort and up to 10% energy savings. • Easy Installation – Rear junction box with cable clamp for easy wiring. • Tilt-forward Design – Detachable wall-mounting bracket for easy installation and cleaning. • Safe Heating – Automatic high limit protection. • Built-in Electronic Thermostat – Maintains room temperature to within 0.5°C (0.9°F) for maximum comfort and up to 10% energy savings. • Energy Savings – Save up to 10% on your heating bill. • Powder coat finish – The polyester epoxy powder coat painted finish resists fading and abrasion for long life and durability. • Warranty: 2-year limited warranty on complete unit; 10-year warranty on element. • Heating Element: Finned, steel sheathed element for durability and efficient heat transfer. • Construction: Attractive one-piece front cover constructed of durable 22 gauge steel. • Installation: Detachable Hinged wall mounting bracket for easy installation. The type QCH Ceiling Mounted Heaters are designed for dens, basements, converted attics, breezeways, garages, bathrooms, small offices, workshops and similar areas. 500 to 2000 watts. Room temperature is controlled by a remote wall thermostat which must be purchased separately. It is pretty tough to find a quality heater in the $400 range that throws out 7,500 Watts! This heater includes a built in thermostat and a ceiling mounting bracket! Qmark Marley MWUH Series Electric Unit Heater. 240/208Volt. Up to 7.5KW. Ceiling mounted. Factories, stores, garages, warehouses, etc. New Product: Kemf HOT-flakes Electric Indoor Heated Foot Warmer Rubber Mats with an incorporated thermostat. Residential or commercial employees working on cement floors, garages or workshops. • Just about anywhere where warm flooring can provide warm feet. • Improves comfort and workspace. • Promotes circulation to lower extremities – promotes body warming. • Ergonomic design helps promote good posture when sitting. • Uses less energy than a light bulb – draws only 80 watts of energy. • Surface design delivers a passive foot massage. HOTflake FOOTWARMER has been pre-tested and set to the correct temperature for use. The mat has been designed so warmth travels upwards, circulating around your feet and legs. • Do not fold or twist. • Do not use if cut or damaged. • Keep away from pets and children. • Keep dry and free from obstruction. This appliance has a polarized plug. To reduce risk of electric shock, this plug is intended to fit in a polarized outlet one way. if the plug does not fit fully in the outlet, reverse the plug. If it still does not fit, contact a qualified electrician. Do not modify the plug in any way. The COS-E Series does not replace the CRA series, it is actually a lower cost, similar heater. Hence it has the potential to become one of Marley’s best selling products.